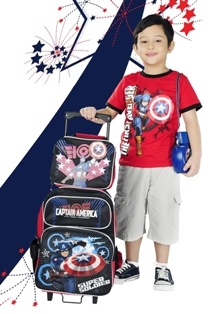 The First Avenger tee with Captain America heroic trolley, lunch bag, and the super jug. Captain America has been a super hero to generations of boys through the pages of Marvel Comics. And with Captain America, The First Avenger hitting the big screen, they can dress with super solider part with Captain America tees and accessories from SM. Boys can boost their superhero credentials and fly the flag of freedom with Captain America inspired tees; or tote along cool backpacks and lunch kits with lots of space for little superhero stuff. The Captain America tees and accessories collection is available at the Children’s Accessories and Character Shop departments of SM City Marilao and SM City Baliwag. Captain America was and is my favorite superhero and a superhero that appears in comic books that has a supernatural power.